Far East Hospitality Trust (“FEHT”) announces its 4Q2015 results on 24th February. Distribution Per Unit (“DPU”) for 4Q2015 fell 8.6% to 1.17. The annualised DPU fell 10.5% to 4.60 cents. Net Property Income fell 4.9% as compared to 4Q2014. Unless tourism picks up, I am expecting the hospitality sector to be soft and DPU to fall further for FEHT. 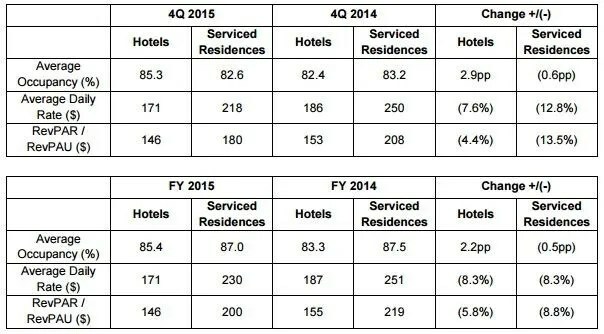 The revenue per available room (“RevPAR”) of the hotel portfolio fell 4.4% year-on-year to $146 in 4Q 2015, mainly due to a 7.6% year-on-year decrease in the average daily rate (“ADR”). The revenue per available unit (“RevPAU”) was down by 13.5% year-on-year to $180 in 4Q 2015.
International visitor arrivals to Singapore was fairly flat with a slight 0.4% increase year-on-year for the first eleven months of 2015.